Welcome to the photo album for Tam Makers, our new makerspace in Mill Valley. 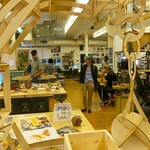 We offer classes, workshops and meetups for adults and youth at Tam High School’s state-of-the-art woodshop. We build things together, learn from each other and help young makers in Marin. Collaborators include builder and teacher Geo Monley, who developed this makerspace, and who is my creative partner for the Art Float for Social Change. Here are photos of our recent activities, classes and meetups, as well as shots of some of the artworks we are creating together.